How do I multiply my money? How do I turn $20k, to $50k, to $100k, to $300k, to $1m etc. through the process of investment in different markets and/or general investing whether it be in an idea, or business. However, our reader is missing two things in her question: 1. time frame and 2. an objective. With the “etc.” on the end and the jumps of 2x to 3x between the values in this series, I am assuming that her plan is to keep going past $1 million to $3 million and then to $10 million (or more). Also, I will assume that she plans to take 2 years for each ‘jump’ i.e. from $20k to $50k, $50k to $100k, $100k to $300k, and $300k to $1million … an 8 year period in total. 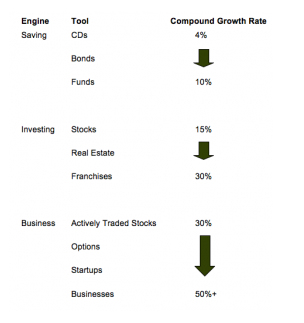 A few minutes with an online compound growth rate calculator (http://www.investopedia.com/calc… ) will show her that she needs a 63% annual return from her ‘investments’. Shooting for $10 million in 12 years increases the required return to 68% and stretching her time frame to 3 years between ‘jumps’ reduces her required return to a ‘more manageable’ 40% annual return. Now, what to invest in for that kind of return? The reason for the higher returns as you work your way down the table is: higher risk + more hands on + leverage of time (using Other People’s Time) + leverage of money (using Other People’s Money). Who ever said it was going to be easy?! This entry was posted in Rich and tagged 7million, 7million7years, Rich, wealth by Adrian. Bookmark the permalink. Some time after I got my finances in order and wiped out my debt, I finally decided on a financial goal for my future. I deliberately chose a relatively high number and short time frame as a way of motivating myself to do more than just sit back and wait for my fortune to build itself. Based on that calculator you linked to previously, my money would need to grow at around 63% annually to meet my goals, assuming I just plodded along at my current pace. So I asked myself: what if I met my goal today, right this moment? What if I had built an investment portfolio that would allow me to retire and I didn’t have to do anything I didn’t want to? What would I do? When I came up with the answer, I then asked myself “how do I make money doing this?” That part was easy enough. So I figured, why not start doing it now? Why not make my fortune by doing something I enjoy so much that I’d do it even when I won’t have to? (And then I wondered “what the hell took me so long to figure this out??? ?”) So I’ve built my plan around that. If it works out as planned, I’ll have a revenue stream that can continue to grow even after I’ve stopped the activity that created it! Anyway, the point is that the lesson I learned was this: find that one thing that you want to do more than anything else, and find a way to make money at it. And don’t give up until you do. How much better can life get than that? The only investment that I would recommend that has any chance of returning 100x in 3 years, yet has very little downside, is investing in your own education (financial &/or vocational). Alternatively, invest some (not all) of the money in starting an online business … whether it succeeds (unlikely, for your first business) or fails (much more likely), you will have gained a wealth of entrepreneurial experience and education for a very small cost.